Patient safety gauges a healthcare facility’s ability to provide its patients with quality services and care. This key performance indicator measures a hospital or clinic’s track record of keeping patients safe from contracting infections, post-procedure complications, and other issues like sepsis. Patient safety in hospitals focuses not on pre-existing conditions or issues that are the result of external factors, but rather on the issues that stem directly or indirectly from the care provided in the facility. This KPI serves several functions, but it is primarily a measure of how well a healthcare facility cares for its patients, and what areas are causing issues that can be improved. Understanding the negatively impacting patient safety is vital in constantly improving the quality of service. This includes the procedures taken to ensure patients’ health, the standard practices used for cleanliness, sterility, treatment, monitoring, and more. 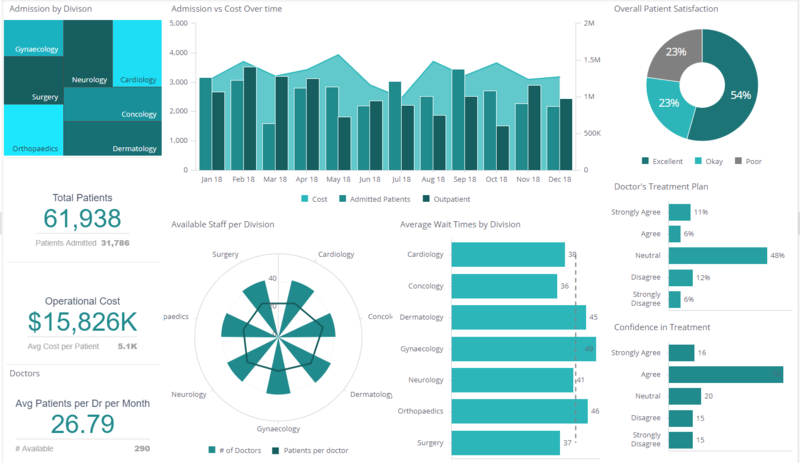 To measure patient safety as a function of treatment outcomes, the first step is understanding which problems are being monitored via healthcare data analytics. Unlike some metrics that are straightforward to track patient safety is measured through several other statistics. This includes different negative outcomes (infections, post-operation complications, sepsis, and others) that are the result of treatment. Measuring patient safety involves analyzing the total number of patient treatments and comparing negative outcomes from treatment to positive outcomes. What Data Sources Should I Use to Measure The KPI? Most data required to measure patient safety comes from treatment reports, patient logs, and other procedure-related data. Information gathered during post-procedure care is vital in measuring patient safety, as are statistics related to procedure outcomes. Imagine your healthcare facility or clinic has noticed that a disproportionate number of patients that are being admitted for seemingly simple outpatient procedures are having longer-than-expected stays. Upon further inspection, you notice that many times, even the smallest surgical procedures and other treatments are resulting in high rates of easily preventable infections. By measuring the number of negative outcomes that result from treatment, as well as where in the care process they’re occurring, the hospital can optimize care and establish better practices to reduce the risk of infection.